South African university students have demonstrated outside the headquarters of the country's ruling African National Congress party over tuition fee hikes. A crowd of thousands protested outside the ANC's offices in Johannesburg before student leaders handed over a list of demands, including a freeze on tuition fee increases, to ANC secretary general Gwede Mantashe. South African media reported incidents of violence elsewhere, including the police use of pepper spray on students at the University of Johannesburg as well as the use of stun grenades to disperse some demonstrators in Cape Town. Students also converged on a courthouse in Cape Town where about 30 protesters were taken after being arrested during a rally outside parliament that turned violent Wednesday. Those detained, who face charges including public violence and trespassing, were released and are due in court again in February, the African News Agency reported. 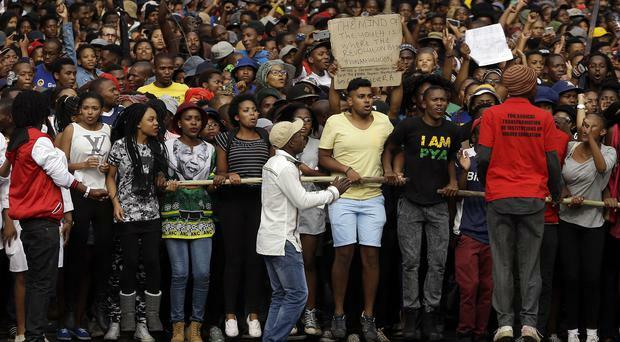 Protests were also held in other South African cities on Thursday. Students marched peacefully to the provincial legislature in Pietermaritzburg, and another group blocked the entrance to the building of the higher education department in Pretoria, according to South African media reports. South African President Jacob Zuma will meet university managers and student leaders at government offices in Pretoria on Friday, Mr Zuma's office said in a statement. "Nobody disagrees with the message that students from poor households are facing financial difficulties and possible exclusion," the statement quoted the president as saying. Critics, however, allege that the government is not doing enough to subsidise the university education of its youth, many of whom struggle to pay for school.